With an attendance figure approaching 900, Fuse ’95 was certainly a popular event. Typographic conferences, it seems, can be big business, provided they pick the right location (as Pierre di Sciullo remarked, a conference on typography in France would be luck to attract 30 to 40 delegates). The profile of the participants in Berlin showed that over two-thirds came from Germany, perhaps prompting FontShop to announce their own annual Berlin conference starting in 1996. Despite the high price tag, nearly half the delegates were students. Fuse ’95 offered a packed prgramme of 24 ‘star’ speakers over three days, including Gerard Unger, David Carson, Rick Valicenti, Erik van Blokland and Just van Rossum, Tobias Frere-Jones and founders Neville Brody and Jon Wozencroft. The issue of the lack of women speakers at fuse ’94 was addressed but not resolved by the tokenistic inclusion of two presentations by women – Teal Triggs for WD+RU and the all-female German design group Moniteurs. Approaches to the presentations were extremely diverse, encompassing the bilingual (Erik Spiekermann), the high-tech (Jeffery Keedy), the exhibitionist (Max Kisman) and sensory overload (Branczyk and Nagel). The quality was very uneven, though at least unlike last year most speakers were well prepared. The best presenters were able to position themselves and their work within broader theoretical and cultural debates, while the weaker ones used the opportunity for self-promotion. David Crow, Keedy and Triggs all gave tightly organised lectures in which points were developed and then illustrated with reference to their own work, leaving listeners with something to think about. But the egos of many designers get in the way of establishing this as a standard, posing a problem for conference organisers whose ambition is to contribute to the growing debate surrounding graphic design rather than simply to wheel out a roster of star names. Fuse ’95 attempted an issue-based approach, but the disjunction between some speakers’ lecture titles and what they delivered was noticeable. The grand theme of the ‘end of print’ was raised by a number of speakers and perhaps unsurprisingly was the title of David Carson’s presentations. 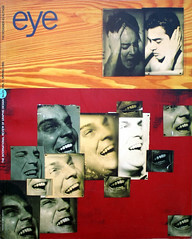 He was careful to pose the ‘end of print’ as a question, while at the same time indicating a new direction in his work by showing a film he had made in collaboration with William Burroughs. Keedy told us that print would no longer be cutting edge – all the innovation would happen in interactive design, where ‘time and motion up the ante in typographic complexity’. By contrast Wozencroft, in what seemed to be a mystical homage to early Modernism through the medium of film, advised us to ‘reach for the language of sensuality’ and not to ‘collapse into the digital maelstrom’.The big intellectual idea to emerge was the discovery of ‘context’ as a determinant of meaning. David Crow presented his experiments in recalculating unofficial language (graffiti) in new, authoritative contexts and discovery of how this transformed the meanings such marks conveyed (see Eye no. 19 vol. 5). Ian Anderson discussed Designers Republic’s ‘irreverent pilfering’ of established imagery, ‘the language of logos a-go-go’. It was contributors rather than its founders who stressed Fuse’s potential: Paul Elliman and David Crow both confirmed its research-based spirit (‘Fuse allows us space to go further,’ said Elliman). Brody described Fuse as a catalyst, an agent of change (for a moment I thought he was going to tell us that Fuse – like Dada – was a state of mind, but luckily we were spared that excess). Brody suggested that Fuse as a product (a set of typefaces on disc accompanied by a poster) seemed less significant now than the conference. Fuse appears to be going through a process of redefinition and even early recuperation – FontShop is re-issuing four Fuse typefaces as ‘classics’ under the FontFont label and a CD-ROM assembling the results of the first 10 issues, billed as ‘an invaluable database of this phase of Fuse’, is available. All this is suggestive of retrospection rather than proactive vision. FuseLab, which ran parallel to the programme of main speakers, sadly did not manage to make its presence felt and became something to be fitted in if possible. Little was done to engage onlookers, though those designing on the Macintoshes probably found it a stimulating environment. The networking potential could have been exploited more imaginatively – a row of computers offering access to the Internet was a start, but putting out journalistic hype about the conference of the Fuse Web site was not enough: what was needed was some debate about the Web with some interesting projects running. That FuseLab needed more creative management was brought home by a lecture by Petr van Blokland on TypeLab at ATypl. As a participant in TypeLab in Antwerp in 1993, I recall it as an energetic forum for creativity and debate, qualities lacking in FuseLab. The biggest failing of Fuse ’95 was the lack of opportunity for exchange of ideas. The tight schedule meant there was little chance for discussion between sessions, and there was no time allocated for questions, making for a one-way experience with minimal interaction. It should have been possible to relay conference presentations to a big screen in the foyer or in FuseLab so people could absorb and discuss ideas in less formal surroundings, or to make conference presentations available on tape so delegates could participate in FuseLab or form informal discussion groups secure in the knowledge that they could match up later on what they had missed. The criticism apart, Fuse ’95 was successful because it stimulated thought. But this is no reason for complacency. It is not Fuse’s fault that graphic design, and in particular typographic design, is dominated by white middle-class males, but if Fuse wants to hold that radical card it needs to do more to challenge that status quo. Of the many meanings attached to the word ‘fuse’, let us not forget that one of them is a touchpaper for an explosion that transforms the existing landscape.